I have been travelling much of the past few weeks. Last week I was in the Middle East. It was hot. Really hot. The region has a few issues. Such as no long wings. Some nice people though. The week before that I was in San Diego to visit/help my mom. My sister joined me. I was the last kid in a larger family, and even though I am now in my 40s, I am still the baby in family. It will always be that way. Which has pros and cons. Growing up, the rules that applied the rest of the siblings never seemed to apply to me. Parents tend to experiment on the oldest kid. The first kid has it the roughest. No doubt. By the fourth, parents are just happy if you come home. Eventually. The downside is that I have about ten photos of my youth and those were largely team or church photos. But I am not nostalgic and I don’t envy other situations. My friends who are only children have the weight of the entire family history. And are reminded of it. They not only get a chance to disappoint their parents but their genetic tree. 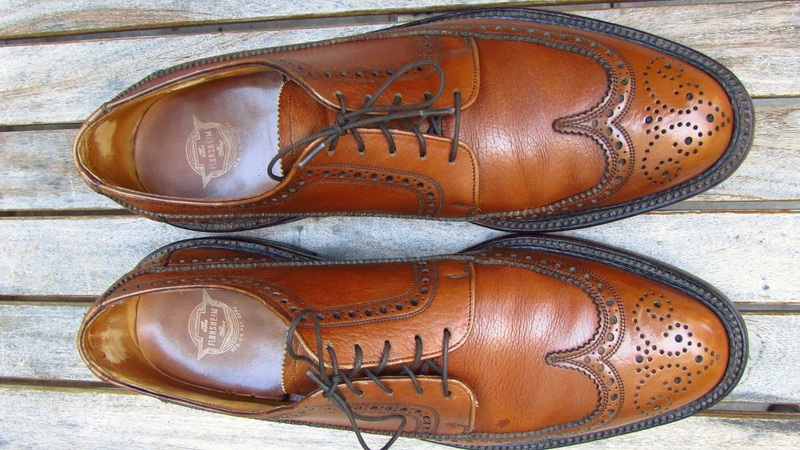 This post covers the a few of the pairs I have restored over the past year. Which isn’t a lot of time when you consider the age of the shoes so maybe I will call this a longish term update. 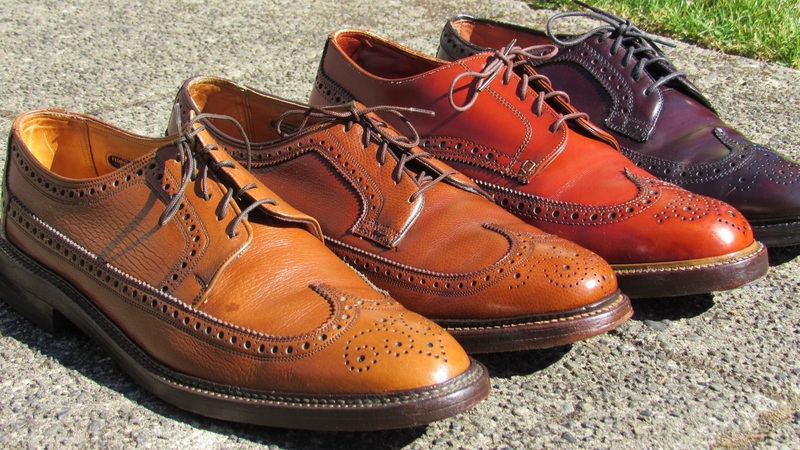 There have been other shoes I have restored but I have been wearing all these pairs regularly and have even worn a couple of the pairs this week. I really wanted to love this pair but I don’t. The style is great. Nettleton made one of the best looking vintage long wing bluchers. You can recognize a pair due to the heavy broguing and the cross stitched into the eyelet facing. Modern long wings from J. Crew and Grant Stone show influences of this style. The main issue I have is that the shoes are a bit big on me. The pair is roomier than my other 12 C pairs. Wearing thicker dress socks has helped ameliorate the sizing issue but who wants to wear thick socks in the summer? Also the original heels need to get replaced. Heel taps were added but I don’t really like heel taps. Whose fault is it that they still have the original heels? Mine. Never blame the shoes. 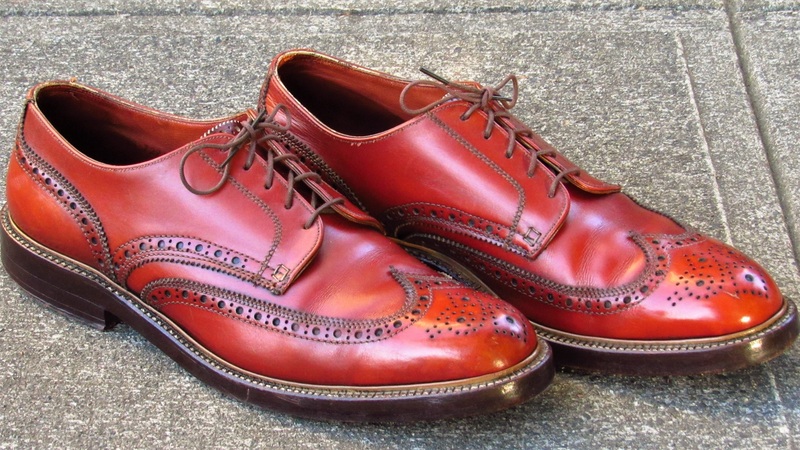 This was one of the first pairs I used glycerin conditioning on. I haven’t found any issues. The pair has kept its post restore shape. 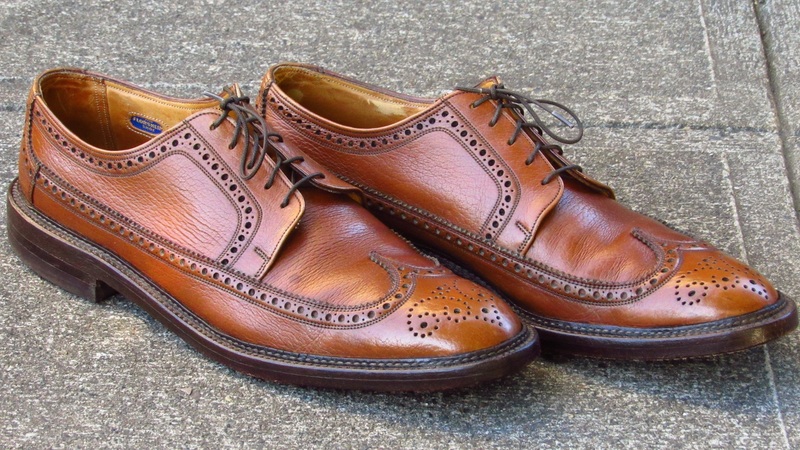 I have been maintaining the shoes with Bickmore Bick 4 and Allen Edmonds Cordovan Cream. I recently switched to using Collonil 1909 Burgundy Cream and have liked that product. I have used Saphir Renovateur and Venetian Shoe Cream with the pair but both products were removing too much of the cream coloring that I had applied. The Shell upper has darkened since the original restore and that is likely due to the continued application of color creams. 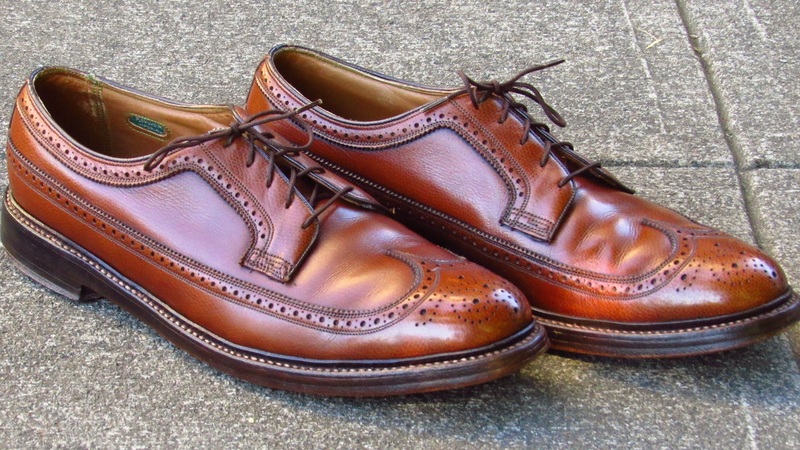 There are a couple dark stains near the heel but they are not noticeable when wearing the pair. If you look at the before and after photos, this pair went through the most significant transformation. So I am happy with the restoration process but this isn’t a pair I seek to wear. 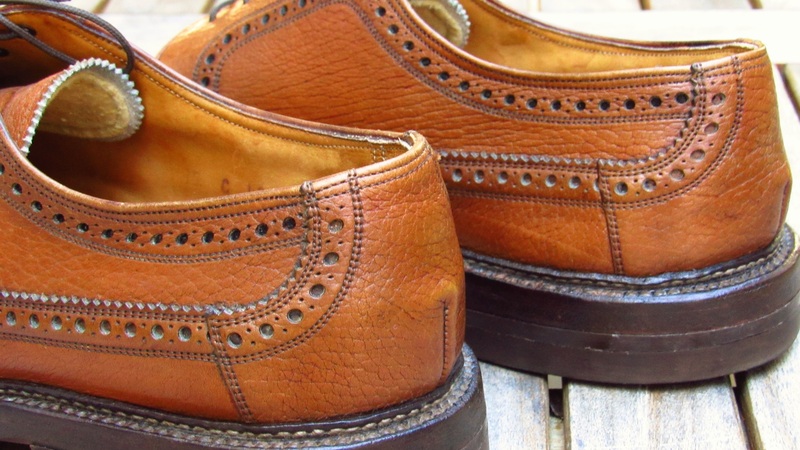 This is a great pair of vintage shoes. I love the wearing the shoes and wore them today. The style is unique. People stare at the shoes when I wear them. Its like driving around the city in an original Hummer. Or what I can imagine that’s like. These shoes are probably more comfortable than a Hummer. The shoes have a reddish orange color, like brick or terracotta. The color and style makes it tough to pair with most clothing options. I usually wear them with a pair of forest green pants. 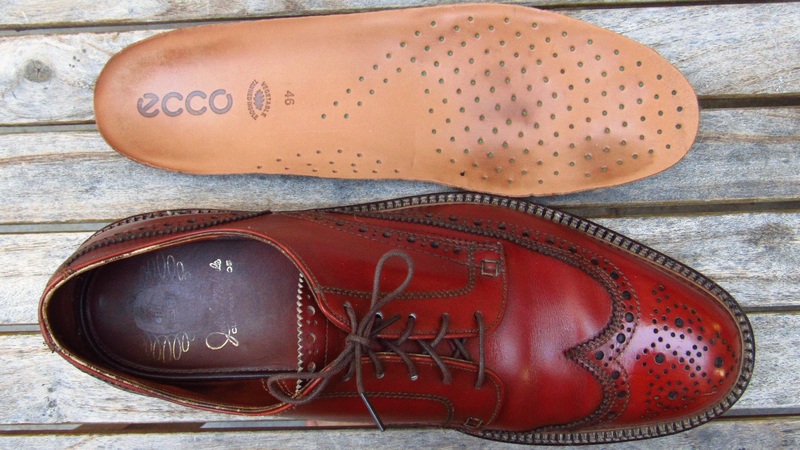 The shoes are a 12.5 B and I normally wear a 11.5 D or 12 C. I used a Ecco leather footbed to help with size difference and that has worked great. The shoes are very comfortable. No issues with them at the end of the day. The triple soles and heel height give me an extra 1.5″ in height. I am already tall so I feel like a giant wearing them. Unlike the Nettleton pair, you don’t see modern shoes using any of the John McHale innovations such as the gold colored reverse storm welt. So sad. The shoes are well built. Each shoe weighs almost two pounds. 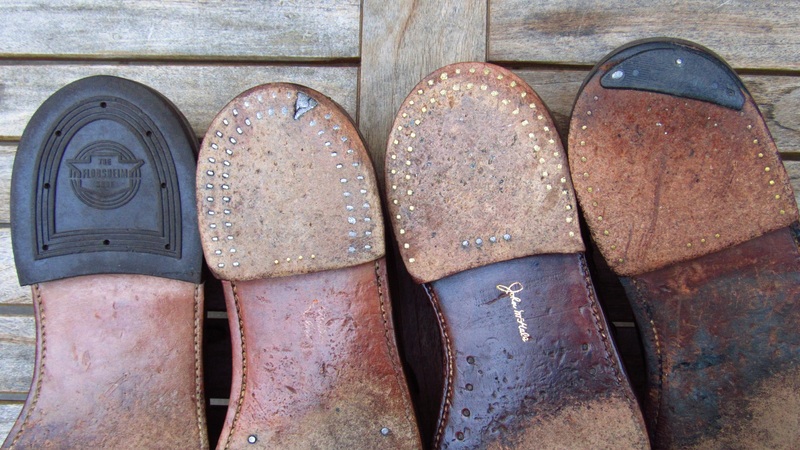 There are two rows of brass nails in the heel and 10 nails in the sole. Lots of metal. The upper leather is very soft and has held up well over the years. I have been conditioning the pair with Bick 4 and neutral Collonil 1909 Cream. I haven’t used any colored polishes or waxes. Is there anything not to like? Yes, the shoes have zero traction and make the Florsheim suicide heel feel like a pair of Nike shoes. The lack of any grip forces you to walk very deliberately on smooth surfaces. The only thing keeping you connected to the earth is gravity. The shoes make you feel alive. I like that. When I am not in a hurry. This was the pair I documented using the glycerin conditioning post. The glycerin process was something I learned from a few Japanese shoe bloggers. I have used the process on a few shoes and the results have been good thus far. But past performance does not guarantee future results. Anyway. The leather on the shoe is pretty amazing. It has almost no creasing. This might be a feature of the leather. Or a result of the conditioning. Or due to the east-west grain pattern on the vamp. Or a combination of the three. Or something entirely different. 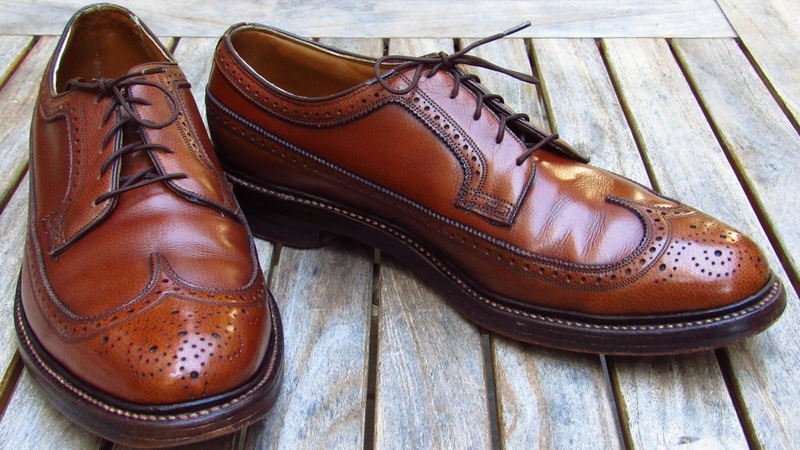 The fit on this shoe reminds me of the Allen Edmonds 65 last. It feels a bit narrow and it has a long pointy toe box. The shoe has less cushioning than a Florsheim Imperial Kenmoor. The heel counter feels lower. Its less comfortable than my other Florsheim Imperials. On the plus side, the shoes have good traction due to the rubber heel. I have been maintaining the shoes solely with Bick 4. There is blue-green tint to the edge of the leather. You can see it in the broguing. At first I thought it was dust but the color seems to be a characteristic of the leather. Is it from a chrome tanning process? I am not sure. It bothers me somewhat and I have been thinking about working dark brown cream into the broguing to cover it. But apparently it hasn’t bothered me enough to do something about it. I prefer the fit of many of my other shoes but I wear this pair often. I keep coming back to the pair. The style is vintage cool. Onward. While we debate facts in this country, some truths cannot be debated such as teens are lazy and vintage Florsheim Imperial Kenmoors are a nice pair of shoes. This is another pair that I love to wear. They look good and fit well. 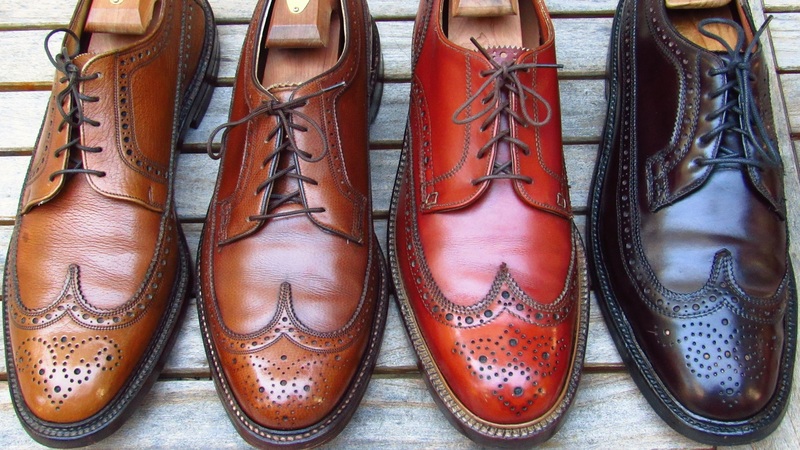 A new Allen Edmonds store opened in downtown Seattle recently and I stopped in to take a look. How could I not? I was wearing this pair and the manager noticed them and asked me about them. 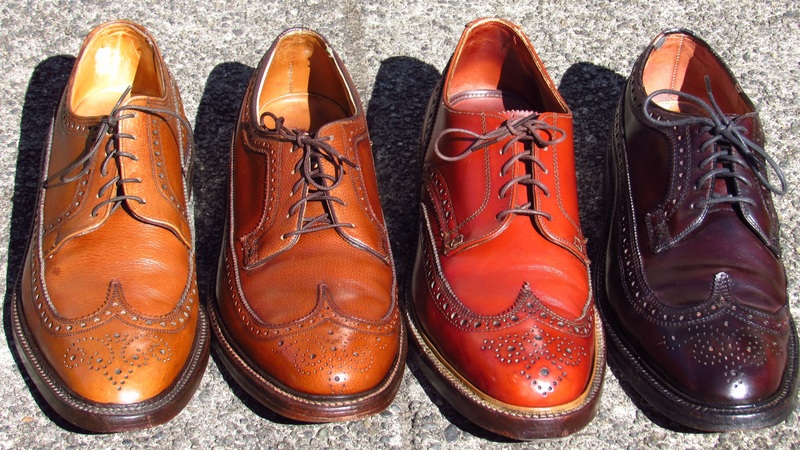 We talked about the shoes and vintage Florsheim. And then we talked about Dalton boots. I need a pair. 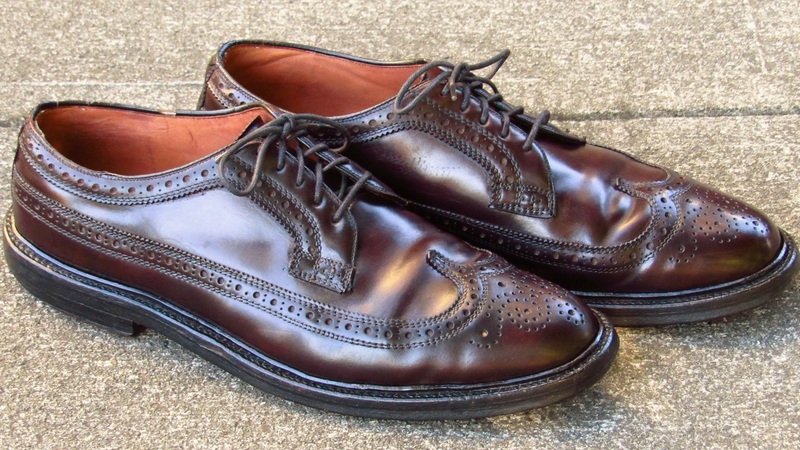 For maintenance, I have been using Bick 4 and Allen Edmonds Light Brown shoe cream. The AE cream easy to use and gives the shoes a nice shine. A little goes a long way. 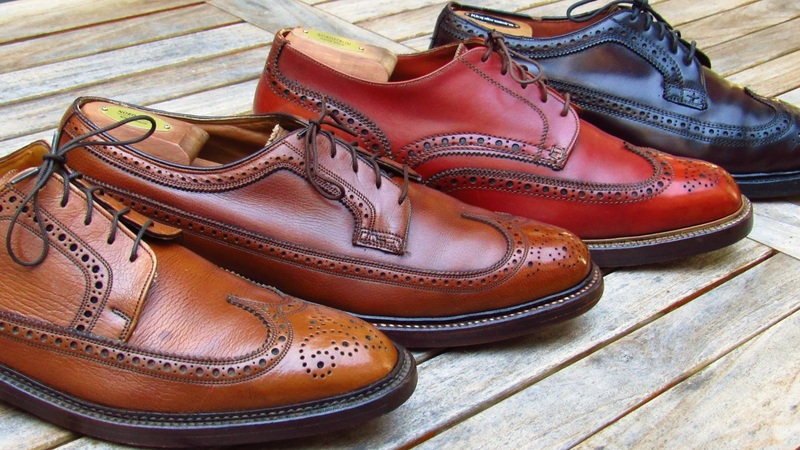 The shoes have the original Florsheim leather and v-cleat heel. It’s basically a steel heel held in place by leather. This means limited traction. I do like the sound the shoes make when walking on pavement. I don’t fear much in life but the idea that someday these shoes will wear out gives me pause. But given that they are Kenmoors, that day should be well into the future. I am not losing sleep. And I will have likely lost my mind by the time they wear out. So at least two more years. Below are a few more photos of the four pairs. Great post. Beautiful shoes. Keep it up! Thanks for the post, I was starting to experience withdrawal symptoms. I don’t think that’s a good thing! I drive down to Blaine tomorrow to pick up my new Taylor-Made PTBs! A nice review post. I was also getting a little withdrawal symptoms. 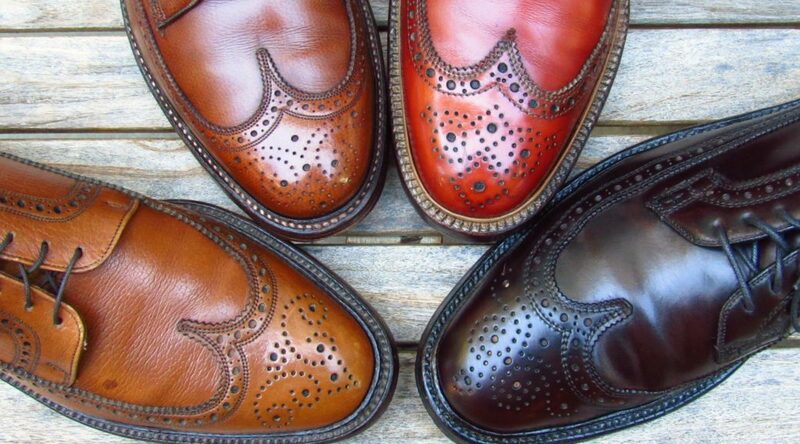 Please post a mention of the new entry on the vintage shoe thread and drive a few visitors this way. All 4 pairs look so nice after being conditioned and polish. 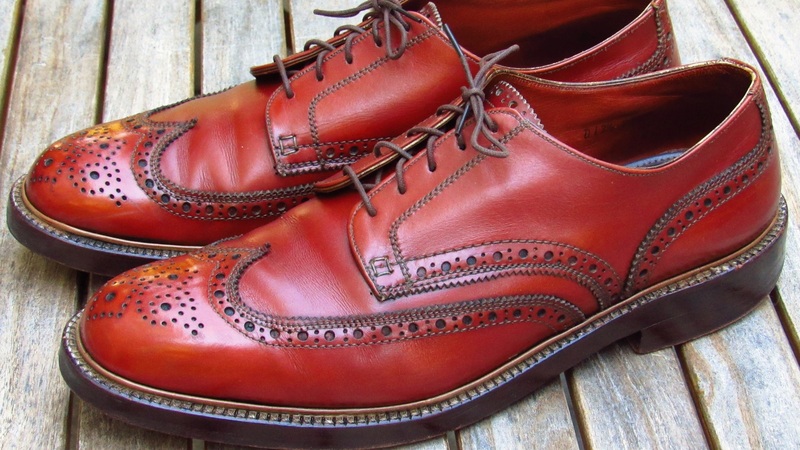 The Florsheim Imperial Kenmoor leather looks amazing. It’s hard to find an article like this which has the color depth and light scotch/pebble grain texture like this leather. What I find so impressive the the brass nail pattern on the toplift and just the amount of nails per pair. This is something current GYW makers rarely do. Well noted on the gold split reverse welts! Thank you. The Kenmoor is a fantastic shoe. 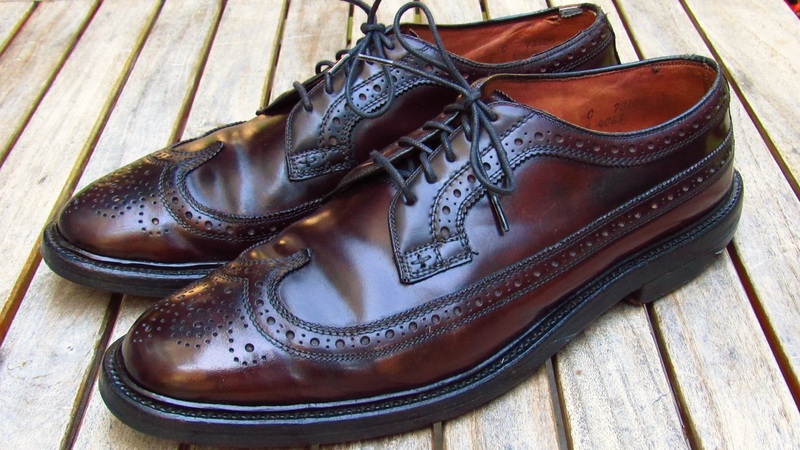 I just purchased pair Florsheim 93602s, but with a edge v-cleat, so I suppose that makes them pre 1973. Still working on cleaning them, but the initial work is revealing contrast stitching. I can’t believe how good of shape they are in for the age. Great article; stunning photos!! You make me feel normal for justifying to my wife that 2 or 3 shoes of the same style in a different color is necessary and justified. “The region has a few issues. Such as no long wings. Some nice people though.” L-O-L. As usual, well written: informative and entertaining. Keep it up!